50 programmes in total with hundreds of frequencies that can be automated. There is also the opportunity to programme your own frequencies too. 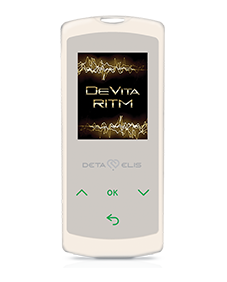 A total of 50 programmes can be installed onto the DEVITA MINI RITM and each programme can accept up to 50 frequencies. There are also 15 pre-installed programmes covering a vast array of different bodily systems and symptoms. All the 1,500 programmes for many organ systems are available on the in-built SD card, so the DEVITA MINI RITM does not require the DEINFO USB as does the normal DEVITA RITM device. So there are approximately 1,500 frequencies that are available for you to programme your device, as well as adding your own frequencies too – see and download the Mini Software Manual below. Chakra centres, energy, anti-stress, circulation, kidney detox, lymphatics, detox, gastric system, metabolism, women’s health, men’s health, heart health, sleep, hormone balance, gut health, joints without pain, joints without inflammation, immunity, cellular respiration, kidney health, prostatitis, vitality, all-body detox, metabolism, blood pressure regulation, insomnia, poisoning, arthritis, normal cardiac rhythm, vision, good mood, wound healing, women’ sexuality, men’s sexuality, exercise, warm-up, allergies, healthy veins, headaches, blood sugar regulation, memory, colds, breathing, skin, hair and nails. You also have the ability to join programmes together to form COMPLEXES which is easy to run – simply choose the COMPLEX you have created and press the start button and they will all run sequentially one after the other and then the device will switch off automatically as soon as the COMPLEX has completed. This make the device very user friendly! This new generation MINI RITM suits all people from all walks of life and is a way of maintaining wellness on many different levels of body health simply by choosing the programme complexes you wish to run and clicking the button. The device is so small that it can literally sit in your pocket whether you are at work or home, or out shopping. It will run for hours at your heart’s content! The batteries are enclosed and are rechargeable, type Li-Po 3.7 V, running for about 20 hours per charge. The SD card will open up once the device is plugged into your computer using a USB cable supplied. It will only work on a Windows PC, not a MAC computer. The device includes 15 basic pre-installed complexes consisting of manual and automatic programs. Each user can create their own unique complexes (the whole device can hold up to 50) and has the ability to download new complexes and programs via the SD card installed.Works in 6 languages. Has an LCD display. There is no need to use the DEINFO USB programmer as in the normal RITM devices – so this alone saves money. It is stylish, convenient and ultra portable. The device is so small that it can literally sit in your pocket whether you are at work or home, or out shopping. It will run for hours at your heart’s content! Apart from the 15 pre-installed programmes on the MINI-RITM, there are 36 additional slots for programming your own additional frequencies. The MINI RITM device should be used in the morning and can be repeated in one day if required. Simply place the device in your pocket or hang it around your neck, with the screen facing your body as the antenna is at the back of the device. The price of 620 EUROS is inclusive of shipping worldwide! Warning! Bioresonance devices are contraindicated for use by women in the first trimester of pregnancy and by people, who undergone an organ transplantation. In addition, it is not recommended to use the device within the first two months after suffering a myocardial infarction. In case of suffering from serious heart disease, the device must be positioned no closer than 0.5 metres from the body.